Nissan, Cape Town – The New Nissan Leaf will bridge the divide and bring electric cars into the mainstream with its latest model recently launched in Japan. The Nissan Leaf brings about a shift in the EV market – offering all customers a bigger range, in what could be seen as an elite segment. The focus on driver comfort, power, convenience and having a zero eco-footprint is prevalent in the details released at the launch. With the introduction of ProPILOT autonomous park technology, reduced drag coefficients, aerodynamic design and exemplifying Nissan’s core Intelligent Mobility elements: Intelligent Driving, Intelligent Power, and Intelligent Integration. Emergency Assist for Pedal Misapplication. ProPILOT: Autonomous driving in a single lane. The Nissan Leaf can control the distance to the vehicle ahead by staying at a selected preset speed. It can assist in steering, braking and staying center in a lane. If the EV is faced with a stationary vehicle, it will automatically apply the brake and come to a full stop. Only once the driver re-engages (by using the switch or tapping the accelerator gently) will the EV resume once the traffic restarts moving forward. 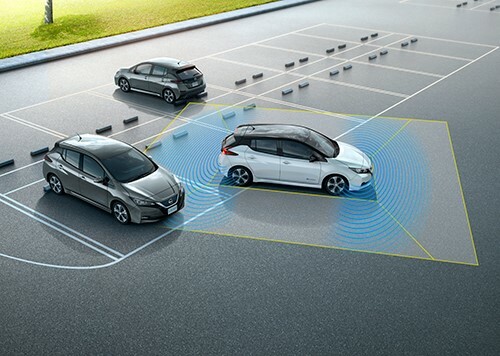 ProPILOT Park: Automatically park using the advanced imaging and ultrasonic technology of the New Nissan Leaf. By combining acceleration, brake, handling and shift change control – the EV can effortlessly guide your car into the automatically identified parking space. e-Pedal: A revolutionary driving innovation that allows a driver to control the start, acceleration, deceleration, stopping and holding of the EV – just by using the accelerator pedal. With simple trigger movements, drivers can reduce their ‘foot fatigue’ by using the e-Pedal in congested traffic and only aggressively applying the brakes in emergency situations. The main attraction to the Nissan Leaf is its increased power output, improved energy efficiency and torque over its previous generation. The driver gets to experience linear driving performance and instant response with the new LEAF e-Powertrain. If the current stats are not enough to make your mouth water, then the version set to launch in 2018 (with a longer range and even more power) will be something to wait for! Nissan is at the forefront of driver-vehicle connections to the greater community. 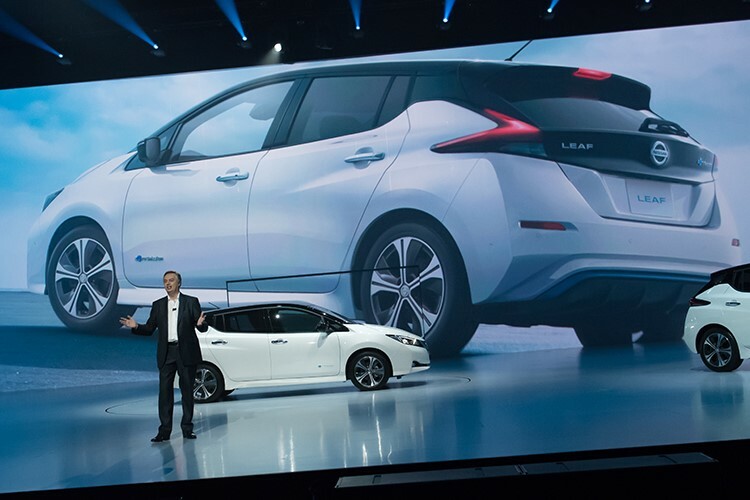 The New Nissan Leaf will use the already established NissanConnect® to share power from homes to vehicles, between other Nissan EV’s as well as share power back onto the grid. By having this ‘vehicle-to-home’ connection, ay surplus collar energy stored during the day can be used to power the home at night. The Nissan Leaf excels on all fronts, including the stability of the chassis, with a sleeker interior and exterior design silhouette. The Body (aka the Chassis): Nissan’s engineer’s improved the chassis for greater stability. By centering the heavier components (like the battery) enables smoother cornering and reduced traditional inertia found in rear/front-engined vehicles. The Steering System: Certain traditional components have been upgraded to provide better feedback from the road, allow for increased steering torsion, reduced shocks or bumps on uneven roads and specifically, improved ride quality and steering control through the Nissan Leaf’s Intelligent Ride Control function. This sporty concept car is no longer just in the minds of geniuses but is now a full-fledged EV that will soon be available to a greater market. Nissan Leaf Interior Design: Nissan used the ‘gliding wing’ framework brand design to extenuate the roomy cabin, open interior and high-quality feel of the thoughtful design features found. The signature blue lighting, stitching, and understated trims offer the driver a cool and high-tech feel while still not being excessive or gaudy. The interface that greets the driver on startup will give the driver all the necessary information in a non-distracting way – allowing the driver to enjoy the ride without feeling bombarded by information. The Nissan Leaf comes standard with NissanConnect® and Apple CarPlay® for a smart, hassle-free drive while operating. Search for information, play music, easily navigate the menus, modify interior functions, access charging statuses or stations and so much more! *Technology availability may vary by market. Specifications are based on the latest product information available at the time of release. Specifications for other regions will be announced at the start of sales. Whilst it is a car that will only be coming to SA next year, our team at William Simpson want to bring this master of intelligent mobility to your attention. Let’s showcase some of the ground-breaking technology and advances that Nissan has brought to the EV market. Contact William Simpson on 021 710 3400 for more information.